This page provides information on Laos-Thailand bus service including schedules and how to book or buy bus tickets as well as visa information. 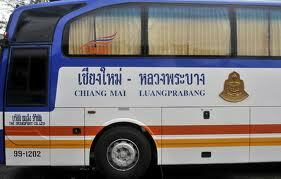 There are several buses connecting many provinces/towns of Laos and Thailand. At the moment, the bus service is available for Bangkok, Chiang Mai, Chiangrai, Loei, Khon Khaen, Nong Khai, Nakonpanom, Mukdahan, Udonthani, and Ubonratchathani. 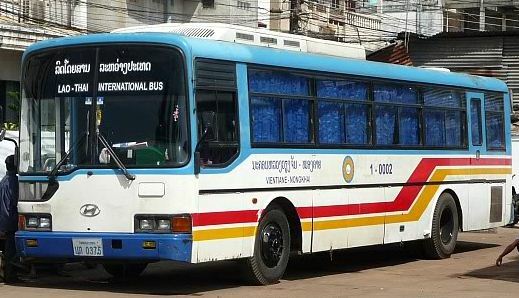 Provinces/towns in Laos that have access to Laos – Thailand bus service are (from north to south) Bokeo, Luang Prabang, Vang Vieng, Vientiane Capital, Thakaek, Savannakhet, and Pakse. Note: Bus schedules are provided as a guide only, they are accurate at the time of this update though they may change without notice. Although online booking facility is provided here, not all routes are available through online booking. It is now possible to book your bus online though some less popular routes are not yet made available. Use the search box below to check if your desired destination is available for online booking. For the routes not available through online booking, you can buy tickets through travel agents or at the bus station before boarding. When buying the bus tickets (to Laos) whether through online channels, a travel agent or at the bus station, make sure you hold a valid passport and already have a Lao visa (if you are not an ASEAN citizen). If you plan to get a visa on arrival, I would suggest not to take the Thai-Lao bus as you risk being left behind because the visa processing usually takes longer than the bus can wait. When you buy your ticket at the bus station, the officer usually runs through your passport to see if you already have a Lao visa. If he identifies that you need a visa and not already have one, he will not sell you a ticket. This is to prevent an issue of someone being left behind at the border by the bus. Buying tickets at the bus station, everyone has to show up at the ticket office to buy their own ticket because the officer does a basic check on your passport and ask questions to verify the information before issuing the ticket. 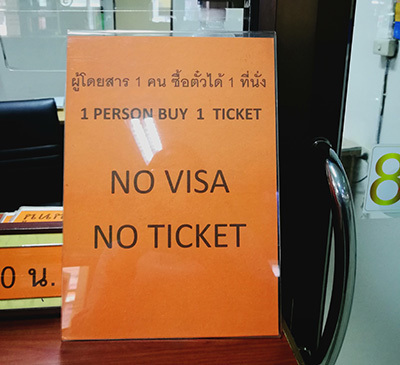 As the sign says "1 person buy 1 ticket", "No visa no ticket". If you are a citizen of one of the countries that need a visa to enter Laos and you have not already got it on your passport, the ticket officer will not sell you a ticket for Thai-Lao International buses. For Lao and Thai citizens residing in towns or provinces near the border such as Udonthani, Nong Khai/Vientiane, Savannakhet/Mukdahan the ticket officer checks your border pass or passport for validity before selling you the tickets. If you are a Thai national you can use either a temporary border pass or a passport to travel to Vientiane, however, if you want to travel to Vang Vieng you need to hold a passport, no border pass allowed for travelling further than Vientiane Capital. For most travelers, visa is required as riding these buses involves border crossing from one country to another. To avoid surprises check if you need a visa before booking your bus. Lao Visa: Citizens of the ASEAN member countries and some of non-ASEAN countries do not need a visa to enter Laos, see if you have Lao visa exemption. For others, visa is required. You can get the visa at one of Lao consulates abroad in advance or get it on arrival at Lao International airports or at Lao International border checkpoints. If you plan to get your Lao visa on arrival, please read "How to book and buy bus tickets". For Lao and Thai nationals residing in provinces near the borders, a visa is not required to enter one another’s country, but a valid passport or a border pass is required. To travel further than the border towns/provinces, a valid passport is required. For example, Thai border pass holders crossing the border to Laos at Nongkhai/Vientiane border crossing points can travel to Vientiane Capital and stay up to 3 days. Similarly, Lao border pass holders crossing the border to Thailand at the Vientiane/Nongkhai crossing points can travel to Nongkhai province and Udonthani province, and stay for up to 3 days. For longer stays, either use your passport (up to 30 days stay) or use your border pass and cross the border back and fourth every three days to get immigration stamp in and out. Overstaying will incure in a fine. This page contains some affiliate links to ticket booking sites. Without any extra cost to you, these sites share a small amount of revenue with me if you book/buy tickets through one of the links. The small commission made here helps keep this site alive and continue to provide free information. Other than all the information I provide on this site, I am also available to help arrange car rental and book bus tickets (VIP buses) for the routes that are not available online. Please feel free to contact me for details.